While some decry the current disequilibrium in La Liga by comparing the Spanish competition to that of the two-cart affair that goes down every year in Scotland, the merengue-loving shills over at Marca seem to have embraced this development. After an opening week in which the margin of victory in every game not involving a team with all the TV money was exactly 1 goal, Marca exuberantly gushes “What a league awaits us!! 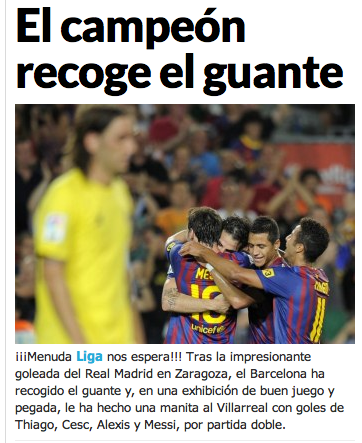 !” because Barca and RM beat their opponents by a combined score of 11-0. What a league indeed–can’t wait for it to be down to two teams in early October.